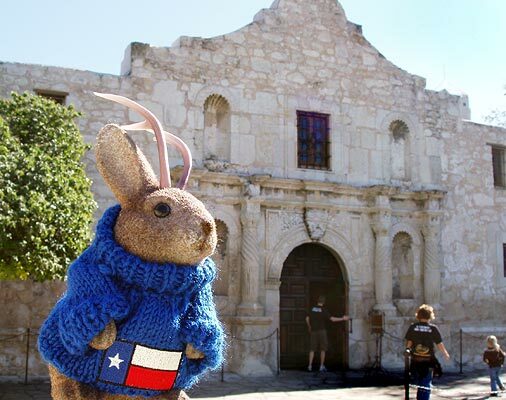 Texans get choked up when the Alamo comes up. We watched the video, went to the lecture, took the tour, visited the museum, asked some questions, walked through all the buildings and visited the gift shop. People from all over come to pay their respects at the Alamo. The main building is a shrine and you are asked to refrain from taking photographs inside it. Flags from each state represented at the Alamo are present in the main building, and each has a banner on it indicating how many people were there from that state. Tennessee had the most at 33. Kentucky was second. The battle of the Alamo is well documented so there's no point in me going into it here, but suffice it to say that the approximately 200 people present there held off Santa Ana's Mexican Army long enough to give the rest of Texas time to prepare for battle. Once the wall was breached, however, the battle was brief. 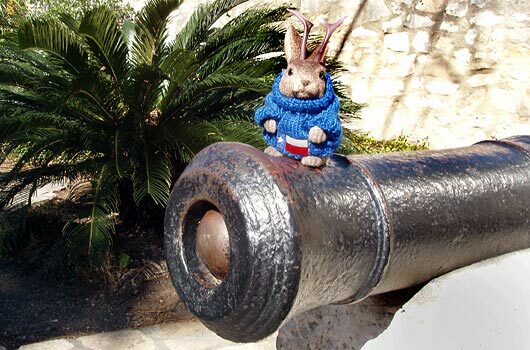 Most of the people at the Alamo perished in the long barracks. Fourteen people survived - women and children. The long barracks is now a museum. 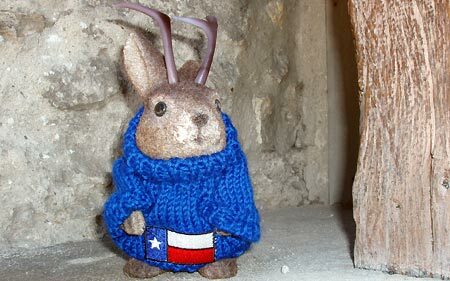 Ace is pictured in a nook outside it, wearing a Texas sweater acquired on a layover in the Dallas airport back in October. "America's first celebrity," as he was described by our lecturer, Davy Crockett, was one of the people who died at the Alamo. 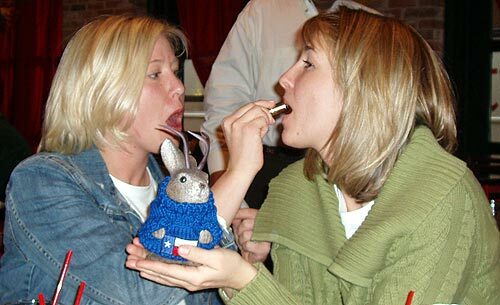 I'm sure that adds to its cachet. It has not always been respected as a shrine, however. The long barracks where so many died was a retail outlet for many years. 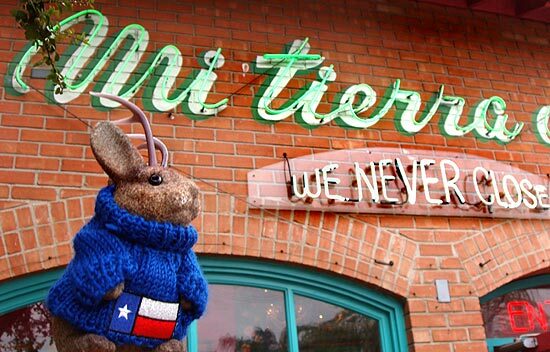 Mi tierra is a San Antonio institution, and while you'll find plenty of tourists, there are also a lot of locals. The Cafe opened in 1941 and never closes. The parking lot was largely Texas plates. It's the place everyone takes their visitors - not only because of the ambiance - but also because they can handle any size group. It's a big place. 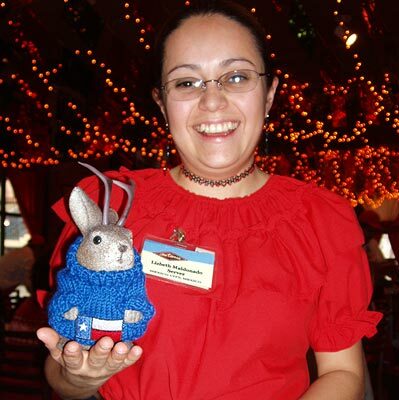 You register with the hostess and get a little buzzer. Your "15 minute" wait seems to more likely be about three - a nice surprise. While you're waiting you can browse the bakery case that runs the entire length of the lobby and get a little something to take home. 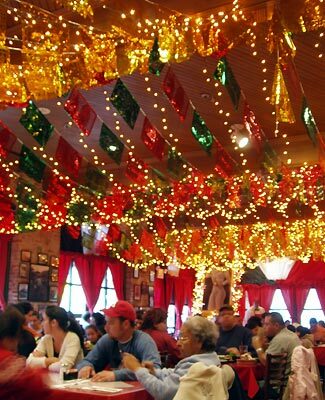 The Lope and I can recommend the pralines - this may not be New Orleans, but they know their pralines nonetheless. 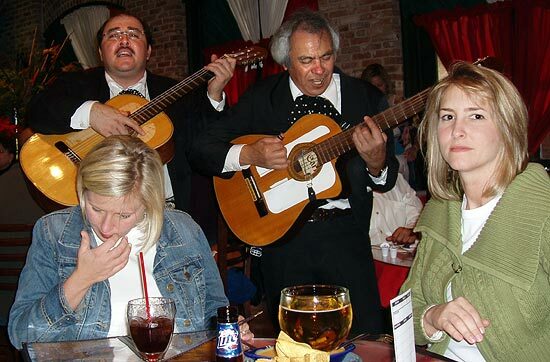 Strolling musicians are part of the appeal of Mi tierra, as these ladies discovered. The ladies asked to see Ace. Apparently, there was break to re-apply lipstick. Texas is a friendly place. 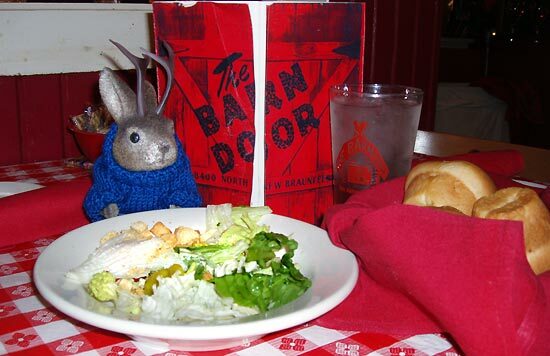 Another local institution Patsy and Ace visited in San Antonio was The Barn Door, noted for its garlic salad dressing. 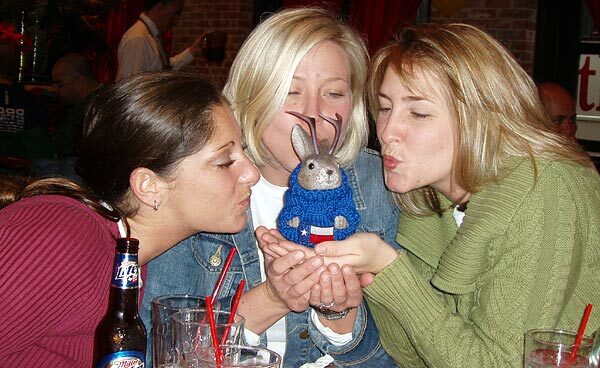 Ace has a way with the ladies, from his lovely drivers to the women who happily pose with him. What is his secret? 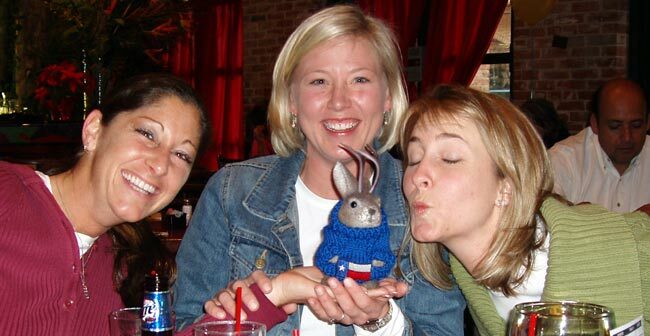 What can he teach us antlerless men about attracting women? Sigerson, long have I sought to learn at the feet of the antlered one. I continually marvel that only a minority of the women we encounter are asked to pose with Ace; it usually just happens, as Patsy tells me it did with the women in this post. If there is anything of this success we might learn from Ace, it is that he goes into any encounter with a human as if he is going to like them, and simply ignores people who are less than hospitable and concentrates on those who are friendly. I imagine his stress level is quite low. He also seems to approach each women as if he sees something beautiful in her, no matter what age, appearance, etc. He simply likes them from the onset - with no agenda in mind - and I think they sense that. The younger ones just seem more inclined to run up to us and ask if they can have their picture taken, especially if they see him posing with someone else. Perhaps the best lesson we can learn from Ace is to see our fellow humans as if we never had before, and give ourselves a chance to like them. That bit of humanism being stated, if I figure out it's some sort of pheromone or something, I'll shamelessly bottle and sell it. Pre-orders, anyone?